Summer is coming, and it’s time to get outside! 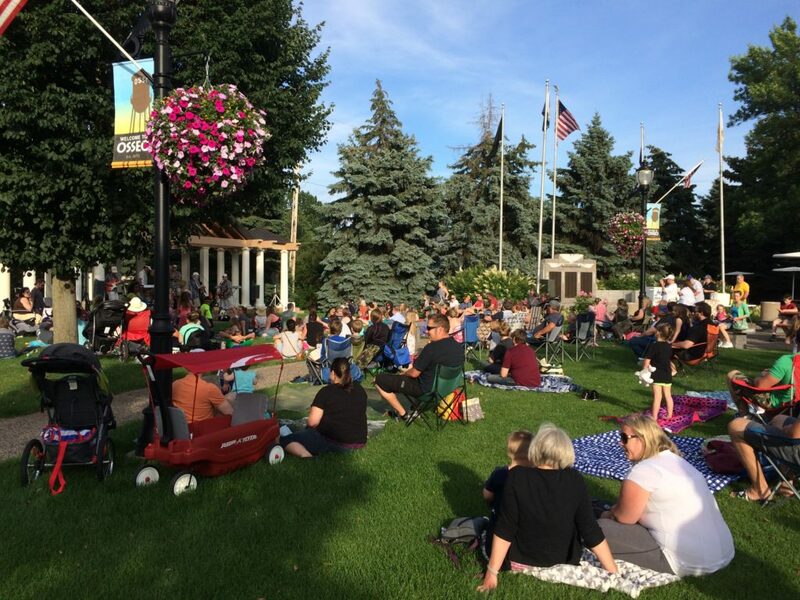 Join your neighbors at Boerboom Park on Tuesday evenings in June, July, and August for Osseo’s all-ages concerts, performances, and movie screenings. This summer, we have new performers and new musical styles! Movies are planned every 2nd and 4th Tuesday. Local nonprofit organizations will again be on hand with treats for you to purchase. All concerts and presentations start at 7:00 pm, and movies begin at dusk (sunset times vary). The season kicks off on June 12 with a performance from the popular Teddy Bear Band, followed by The Lion King at dusk. On June 19, Bluedog, a blues group comprised of Native American performers, will bring their award-wining music to Osseo. On June 26, Snake Discovery provides a presentation and up-close visit with regional reptiles. After the presentation, a screening of the 2017 film Jumanji: Welcome to the Jungle begins at dusk. There is no event scheduled on July 3, but on July 10, The Wildlife Science Center will bring a variety of local animals & wildlife facts to entertain audiences at 7:00 pm, before a screening of Peter Rabbit at dusk. Fan favorite The Classic Big Band and the Nostalgics perform on July 17. The following week, attend a showing of the animated film WALL-E. On July 31, Danielle Daniel from arts organization COMPAS brings an all-ages performance of stories and songs to Osseo. During the Citywide Night to Unite event on August 7, live music is planned. The following week serves as a rain date for concerts, and Wonder will screen at dusk. New to Osseo, the Capri Big Band will play on August 21. Osseo Senior High graduate Bruce Hecksel and his wife, members of the band Patchouli will wrap up the concert season on August 28. The concert is presented by St. Paul’s Lutheran Church of Osseo, in celebration of their 150 year anniversary. The group will be followed by a screening of Spiderman: Homecoming. Rain dates and/or alternate locations are planned for any concerts rescheduled due to inclement weather. For weather-related cancellations and other event announcements, follow Osseo on Facebook (@DiscoverOsseo) or Twitter (@CityofOsseo), or call the city’s weather hotline at 763-425-7669. The summer concert series are presented by our generous donors. Sponsors for 2018 include the Osseo Lions ($3,000), Osseo Fire Department Relief Association ($2,000), and the NW Area Jaycees ($500). Funds are still needed to support the 2018 season. For more information on how to support the summer event series, please visit www.discoverosseo.com/donate or call 763-425-2624. This entry was posted in City of Osseo News and tagged Best Mn City to Start a Family, Movies And Music In The Park, Osseo Community, Osseo Minnesota, Osseo MN. Bookmark the permalink.